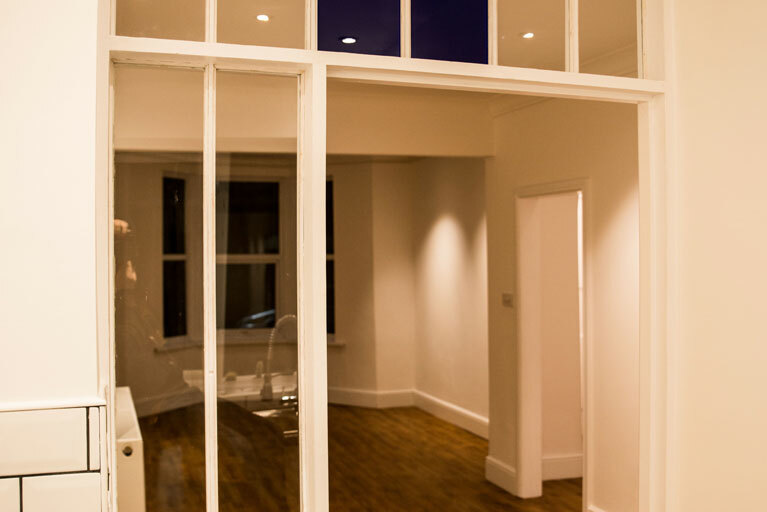 We have recently completed an exquisite domestic project on an open-plan living space. This was a kitchen, diner, lounge and entrance all in one. The kitchen was state-of-the-art incorporating a large American-style fridge-freezer ice-maker, a tap which not only filtered the water on demand but also chilled and added bubbles an integrated microwave and warming drawer and an induction hob situated on an island. The stunning kitchen with oak flooring underfloor heating and white marble surfaces included a “drop-ceiling” above the island. This was lit with hidden rope-light uplighting and square ORLIGHT downlighters. All of the lighting in this living area was run back to a LUTRON dimmer that is capable of dimming all 6 lighting circuits individually. This enables lots of different lighting moods to be achieved. For example the needs of the householder in terms of lighting differ from one scenario to another. For example when holding a dinner party the lights maybe focused on the table (with 10° beam with lamps) and quite low lighting elsewhere. This is in contrast to the levels of light for vacuuming and cleaning the space. All scenarios are pre-set on the LUTRON to avoid wasting time trying to play with the multiple lighting circuits.